Fatemeh Ibrahim Assayed Al-Baltaji or Umm Kulthum, who died February 3, 1975, was an internationally famous Egyptian singer, songwriter, and film actress active from the 1920s to the 1970s. 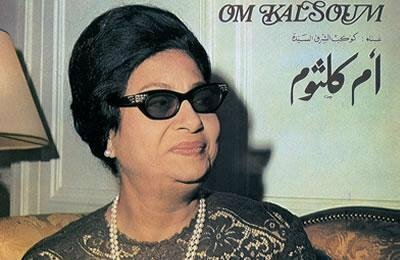 Known for her extraordinary vocal ability and style, Umm Kulthum was one of the greatest and most influential Arab singers of the 20th century. Her father, an imam at the local mosque, taught her to recite the Qur’an, and she is said to have memorized the entire book. When she was 12 years old, her father disguised her as a young boy and entered her in a small performing troupe that he directed. At the age of 16, she was noticed by Mohamed Aboul Ela, a modestly famous singer, who taught her the old classical Arab repertoire. In 1932, her fame as a singer increased through sales of her records to the point where she embarked upon a major tour of the Middle East, performing in important Arab cities such as Damascus, Syria; Baghdad, Iraq; Beirut, Lebanon;Tunis, Tunisia and Tripoli, Libya. The Star of the East died February 3, 1975, at age 76. Her funeral procession became a national event, with around 4 million grief-stricken Egyptians lining the streets to catch a glimpse as her cortege passed. Umm Kulthum is remembered in Egypt, the Middle East, and the Arab world as one of the greatest singers and musicians to have ever lived. It is difficult to accurately measure her vocal range at its peak, as most of her songs were recorded live, and she was careful not to strain her voice due to the extended length of her songs. Even today, she has retained a near-mythical status among young Egyptians. She is also notably popular among Jews and Arabs alike, and her records continue to sell about a million copies a year.